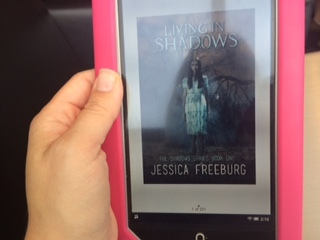 LIVING IN SHADOWS has been available in e-book format for 2 weeks, and I have to say, I’m proud of the way this little ghost story came out of the gate. I’ve made a vow to myself not to check on any stats regarding book sales. I mean, looking at those numbers could make me crazy. But at the end of the day, on June 17th, my dear friend (and Ghost Stories, Inc. brother) Shawn McCann sent me a message telling me that my book had reached #35 in the TEEN HORROR category on Amazon. So I peeked at my stats, and by golly, it was true! Thank you so much to each and every one of you who downloaded a copy. I know many of you are anxious for the print version. I keep joking that releasing the e-book first feels a little like giving birth to a premature baby who is shut away in the NICU, and I’m a proud mommy, but only certain people can see my beautiful bundle of joy (in this case, those who own e-readers). But it won’t be long before the print version will be out in the world, and I can start signing copies for you all! In the meantime, I’m proud of this baby, and invite you all to see it (even before it’s released from my imaginary book-nursery). My new friend (and mommy to Ella’s double-cast-mate in her theater production) even showed me that she was reading it on her phone. Even I had to buy it as an e-book first…so my son could read it… but mostly because I wanted to see it. And while we wait for the print release, be sure to mark FRIDAY (November) 13th on your calendars! Save that date to join me in celebrating, not only the release of the print version of LIVING IN SHADOWS, but also Ghost Stories, Inc.’s first anthology of YA horror stories inspired by our investigations! More details will come soon, but save the date for a night of celebration at a special, historically haunted location in the Twin Cities (and if you’re feeling brave, you can even join us in the after-party ghost hunt)! Thank you again for your support and friendship in all of this! You’ve made pursuing my passion for writing so fun! And I can’t imagine making this journey without you by my side, cheering me on!